Three reasons to choose Affordable Painting & Papering as your Pressure Washing provider. Experience - Affordable Painting & Papering has been pressure washing houses and commercial properties since 1975. Affordable Painting & Papering knows the right pressure and detergent for each custom situation, whether pressure cleaning siding and windows or pressure cleaning walkways and driveways. Your home or business is in great hands with Affordable Painting & Papering's experienced pressure washers. Affordable - Priced just right, Affordable Painting & Papering pressure washing jobs are always competitive and what you would expect to pay for a quality job. Find out today how affordable Affordable Painting & Papering really is. Call for a free quote. Satisfaction Guaranteed - Affordable Painting & Papering guarantees that you will be satisfied with your pressure washing. The job will be done to your specification and we go the extra mile to make sure you are not only satisfied, but actually pleased by the result! Affordable Painting & Papering is a leading provider of Pressure Washing. Our experts have years of experience and can make your house, home, deck, or building sparkling clean again. It does not matter whether your exterior is wood, vinyl, stucco, or brick; filth will stick to it. 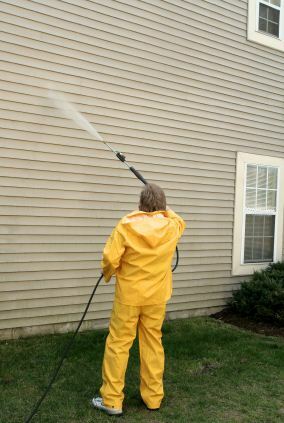 Professional power washing will remove this unwelcome film and restore your home or office back to its true appearance.